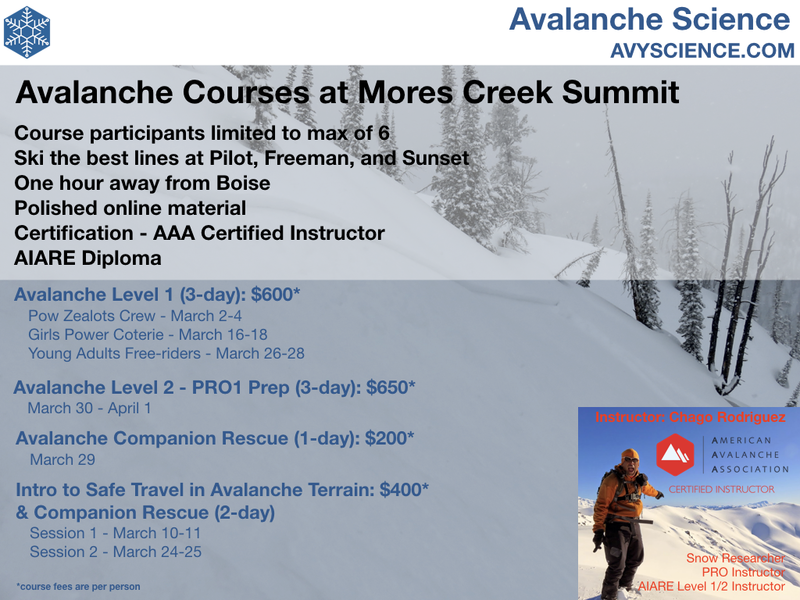 Mores Creek Summit Backcountry Skiing: Tour of Memories - Snow surface Conditions update. 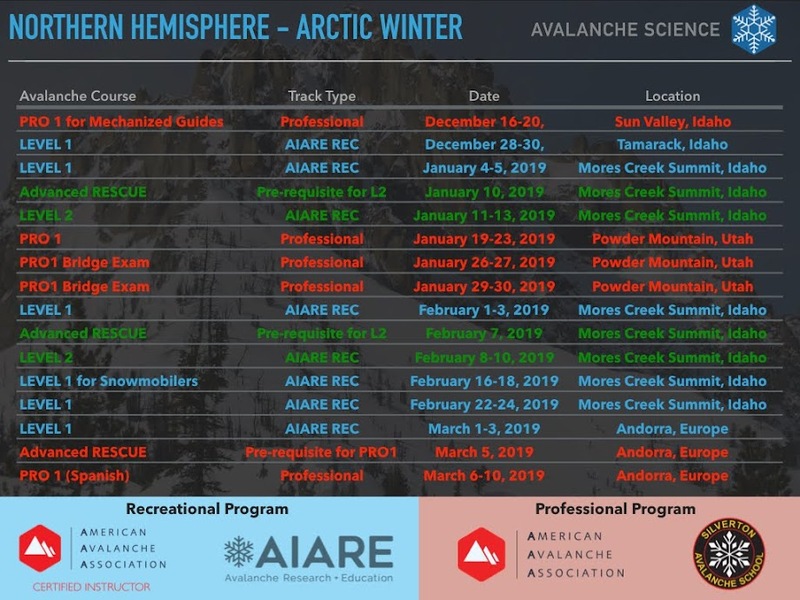 Tour of Memories - Snow surface Conditions update. Yesterday I was delighted to tour MCS with Pedro. It has been a long while since the last time we glided on skis at the place where Pedro literally grew-up skinning and skiing. We have continued to ski tour in Colorado, but it is not the same when you are in the place where there are so many memories. I still remember, when Pedro was 11, and he finally catches up with me at Freeman Peak, while I completed a quick snowpit, and he tells me "Papa, you got to ski down, Alan is in a big-big snowhole". It happens that my friend, new to the backcountry, had a binding failure, and had stepped out of the skis. The snow was bottomless and he sank to his waist and was utterly unable to get back on skis. I remember when some other time, I thought it was funny to dislodge a dry-loose slide of Diurnal NSF snow and bury Pedro to his chest ... and while I hysterically laughed, he just said ... 'very funny' with a sarcastic voice. So many memories. Some memories are reminders of life frailty, like when out of the blue, a large tree came down between me and my other son during a perfect pow day and zero wind. At a relaxed pace, while we enjoyed each other company, we skinned along Pilot Peak road, all the way up to the Pilot Peak-Bear run intersection. As we climbed together we recalled the many ski days we have done throughout the years at MCS. We wondered about out of the ordinary events, such as the avalanche that buried a lucky solo-tourer that was digged out by two snowmobilers that happen to see the slide on an innocent looking south aspect slope below Pilot Peak road, or another slide where Pedro and I saw entry tracks without exit tracks and how we decided to enter threatening terrain to search for a possible victim. We also recalled memories from many powder days, long tours to the West Glades, and the enjoyment of taking friends to our steep and deep shots. Snowmobilers at Pilot Peak road - February 10th 2018. The rain from last Sunday left its mark at all aspect and elevations. At lower elevations (6100-6600 feet), temperatures close to zero are favoring the formation of melt-freeze recrystallization "Near-surface" facets. At mid-elevations (6600-7600) there is a supportable crust, with random pockets of breakable crust. By the way, this breakable crust is very efficient in reminding you that you are NOT an expert skier at all - regardless of what you think - it has a striking ego destroying capacity. Higher elevations have a variable snow surface, with a mix of windblown pow, surface hoar, and near-surface crystals above a rain crust. The day was cold, sunny, with moderate winds from the north. We only ran into a single backcountry skier, but there were plenty of snowmobilers and timber sleds touring the area. It helped a lot to have the Pilot Peak road groomed a few days ago by Greg Davis. The grooming on a very supportive layer of snow made it enjoyable for snowmobilers and skiers alike ... It was like skiing at a groomed run in a resort! And ... of COURSE, we found great snow. That is why MCS is so special! If you try hard and never give up, there are ALWAYS pockets of amazing skiing at Mores Creek Summit. Check the video of Pedro enjoying sweet turns at Pilot Peak bowl, right below the Lookout. PilotFeb10_2018 from Santiago Rodriguez on Vimeo. After the rain and freeze events, the snowpack at MCS has gone into a deep sleep state, with no evidence of reactivity. The buried surface-hoar and basal facets were not impacted directly by the rain, but the extended warm period and rain introduced an outstanding amount of kinetic energy that drove the snowpack to an unusually early isothermal state. This was a topic of discussion during last Wednesday GEOS466-566 Avalanche and Snow Physics course taught at BSU this semester. Students contrasted pit profiles (hardness and temperatures) for last Sunday versus 3 weeks ago. Once we get new loads of snow it is unlikely that the winter "deep instabilities" can become reactive again, and attention should be placed into the myriad of NSF and surface hoar currently at the snow surface. Meanwhile, advanced surface facets and windblown snow at higher elevations are providing a surface that is making skiing fun. After last weekend rain, it was comforting to the soul to ski dry snow ...Yipee! At the top of Pilot Peak, there is a BLM Weather station next to the lookout facilities. The precipitation bucket had a chunk of ice slammed into it. I carefully cleared the bucket. Do not attempt repeat what I did in the future since there are filters that need to be carefully relocated to guarantee its operation. PLEASE - PLEASE - PLEASE ... stay clear of the weather station! Pilot Peak weather station. Data is available through Mesowest (University of Utah). This weather station is critical for backcountry users (skiers and snowmobilers. THIS IS SERIOUS! Myself as well as many others, make LIFE and DEATH decisions based on it. It provides essential temperature and wind data that we use to track avalanche potential and make terrain travel risk decisions. 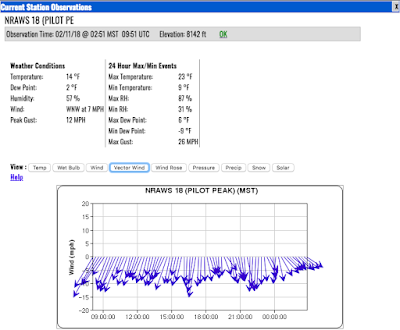 Links for this weather station can be found in the blog 's right side. During this winter there have been periods when the station has not reported data. 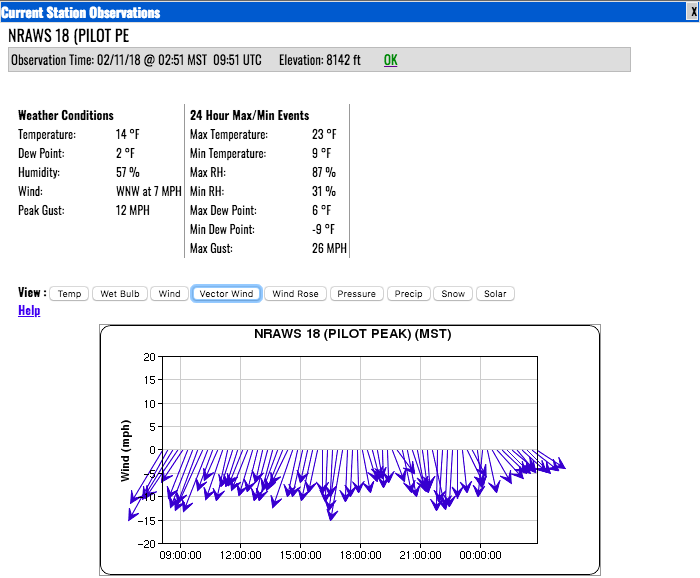 There seem to be times when the data is not being transmitted, others when the data is transmitted but does not make it to Mesowest site, but it is available through NOAA. I have not been successful in identifying the weather station contact person. I will greatly appreciate if a blog reader knows the person responsible for the weather station and might get that person in contact with me. I would like to assist in making this so important weather station more reliable during the winter. I also want to express my appreciation for backcountry users due diligence in staying clear of the interval snow boards and depth stick at MCS pass. THANKS! The data is used to improve snow stability assessments. Winter is not over - and - Winter is coming. 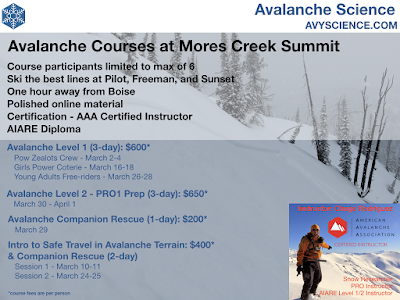 You can finally learn about backcountry skiing at Mores Creek Summit, have somebody show you where to go skiing, all while you learn about avalanche rescue and/or safe touring in avalanche terrain. Check the course line-up for March 2018.